We’re very excited to introduce you to the all-new Assets Pull addon for WP Offload S3. It’s a completely new plugin, written from scratch using a different approach, and intended to replace the original Assets addon. The Assets addon, you might recall, allows you to serve your site’s assets (CSS, JS, images, fonts, etc) from S3, CloudFront, or another CDN in just a few clicks. Making it possible to speed up delivery of these assets and reduce the demand on your web server. This adds onto WP Offload S3’s ability to offload your WordPress Media Library to S3 and serve it from S3, CloudFront, or another CDN speeding up delivery of your Media Library and reducing demand on your server. So why did we need to build a new Assets addon? The original Assets addon pushes files to S3. It scans your site’s filesystem for assets and uploads them to S3. We went with a push solution because at the time the team felt it would be better than pull. With a pull CDN, it retrieves the asset from the origin server on the first request, caches it, and serves it. It then serves that asset from the cache for subsequent requests (until it expires). This first request can therefore be a bit slower. With a push CDN, we push all the assets to the CDN, and now that the asset is already there it can be served on the very first request. When we update a theme, plugin, or WordPress core we need to serve its assets from the web server until all the new and updated assets have been uploaded. Otherwise the site is likely to break using old assets. We have to scan the filesystem regularly for updated assets because files can be updated via FTP, SSH, etc. We can’t rely on WordPress hooks to tell us when something has been updated. Slow and consumes server resources. Recursively iterating through folders, getting directory listings, and checking for file changes is a lot of I/O, CPU, and memory. Unreliable. WordPress doesn’t have a background processing system. We had to bake our own, work out the bugs, and struggled to make it reliable for all web hosting configurations. After debugging hundreds of support requests with our customers and coding dozens of fixes and improvements to our background processing library, the push solution looked like a bad choice. We also noticed that many of our customers were serving their assets directly from S3. They weren’t going through the extra step of configuring CloudFront or another CDN to point at their assets on S3. They were setting up the Assets addon to push their assets to S3 and serving them from there. As we’ve written in the past, you’re better off serving your assets from your web server than S3. This is our fault of course. After you configured the Assets addon to push your assets to S3 it definitely seemed like you were done. If you read our documentation you would know that you should configure CloudFront or another CDN, but we provided very little guidance in the Assets addon itself. We really should have been encouraging this more strongly. For all these reasons, the original Assets addon was not the best solution. We decided to fix that. The Assets Pull addon is a new plugin (not an upgrade) designed to make properly serving your assets as easy as possible using Amazon CloudFront (or just about any other CDN). The addon includes a CloudFront setup wizard to walk you through the process of creating and properly configuring a new CloudFront distribution to “pull” assets directly from your web server rather than from S3. 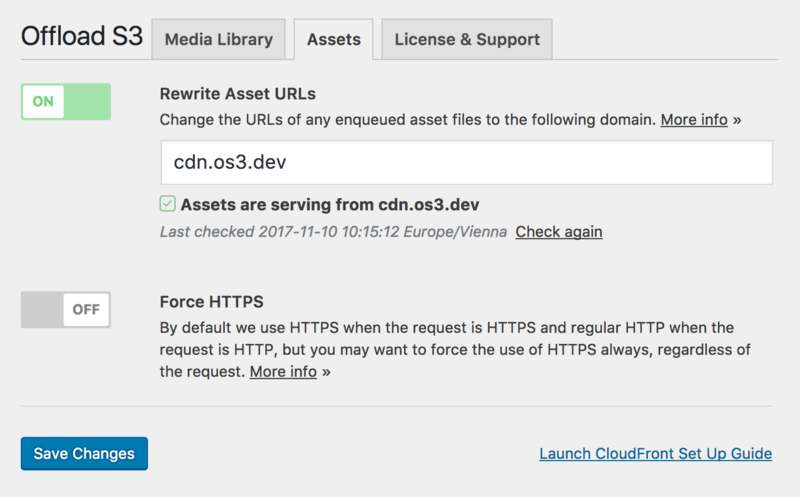 Without the need to upload assets to S3, assets are now immediately available to be served via CloudFront once your distribution has been configured. Another benefit is that the plugin is more compatible with third-party extensions which you might use for minification and concatenation, features not part of the Assets Pull addon. Serving compressed (gzipped) assets is now handled automatically by CloudFront. Perhaps the feature that really sets the Assets Pull addon apart from other similar solutions is the ability to run a comprehensive test on your configuration before you enable URL rewriting. This greatly reduces the risk of experiencing problems due to DNS propagation delays or CDN misconfiguration. With the release of the Assets Pull addon, we are deprecating the original Assets addon. The deprecated addon will still be supported for some time (security releases only) but will eventually be discontinued. Can the Two Addons Coexist? Both the new Assets Pull and old Assets addons can be installed at the same time, but to avoid URL rewriting conflicts only one of them can be active at any given time. Activating one will automatically deactivate the other with a nice notice about what happened. If you have the original Assets addon running on your site, just install and activate the new Assets Pull addon and go through the setup wizard. Your assets will be served from your web server while you’re going through setup. Serving your assets from the web server temporarily should be completely fine as that’s exactly what happened with the original Assets addon any time you updated your plugins, themes, or WordPress core. Along with the release of the new addon, our WP Offload S3 and Amazon Web Services plugins have been updated as well, fixing up a few things here and there. Perhaps the biggest change is that we’ve added notices for sites running a PHP version less than 5.5 (hopefully you never see those yourself). While running a stable version of PHP is obviously recommended, we’ve never required anything higher than what was needed by the AWS SDK v2 (PHP 5.3). But we’re planning to change that soon. Version 3 of the SDK has been available for quite some time and offers some features not available in v2. But it requires PHP 5.5+. This is why we’re warning users about old PHP versions now in this release. We get quite a few requests to upgrade the AWS SDK in our Amazon Web Services plugin to v3. Usually the customer wants to use the SDK in their own development and they require some features that were added to v3 and are missing in v2. Updating to v3 of the SDK is tricky though. We’re already addressing the issue of increasing the PHP version requirements (as mentioned above) but what about those who’ve built on top of the existing Amazon Web Services plugin? It’s been coded for v2 of the SDK. If we update to v3, it’s likely to bork anything they’ve built and could take down some sites. We’ve realized we can’t update the Amazon Web Services plugin to v3 of the SDK. And so we won’t. We’re leaving it alone. The next release of WP Offload S3 will no longer require the Amazon Web Services plugin as a dependency. Instead it will include its own namespaced versions of the components from the AWS SDK that it needs. This means that you can safely load and use whatever version of the AWS SDK you want for your own needs, without conflicting with the SDK code bundled into WP Offload S3! This will also eliminate one of the most common sources of problems our customers experience with WP Offload S3: another plugin loading its own version of the SDK. This causes WP Offload S3 to malfunction and so customers think there’s something wrong with it and reach out to us for help. Congratulations to the rest of the WP Offload S3 team for all their work on this release. Does this new addon sound like something you’d use? Any questions? Let us know in the comments. Not a WP Offload S3 customer yet but like what you see? Get WP Offload S3 with the Assets Pull Addon at the Gold License and above. This entry was tagged New Release, WP Offload S3, Assets Addon, Assets Pull Addon, WP Offload Media. Evan is a former member of the Delicious Brains team. He is a Web Artisan and digital slowmad with deep roots in PHP and WordPress. As an aspiring polyglot and student of software development, he embraces a life of never-ending learning and craftsmanship refinement.